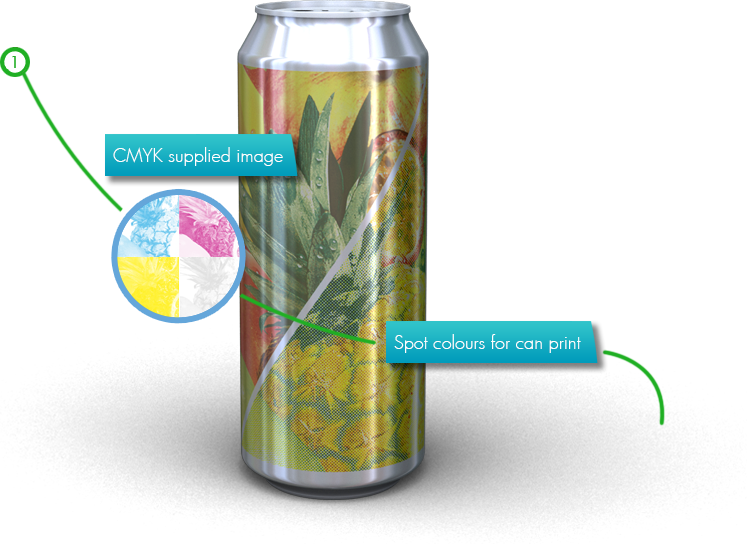 CDI or High Definition, single or double pass, spot colours instead of CMYK. 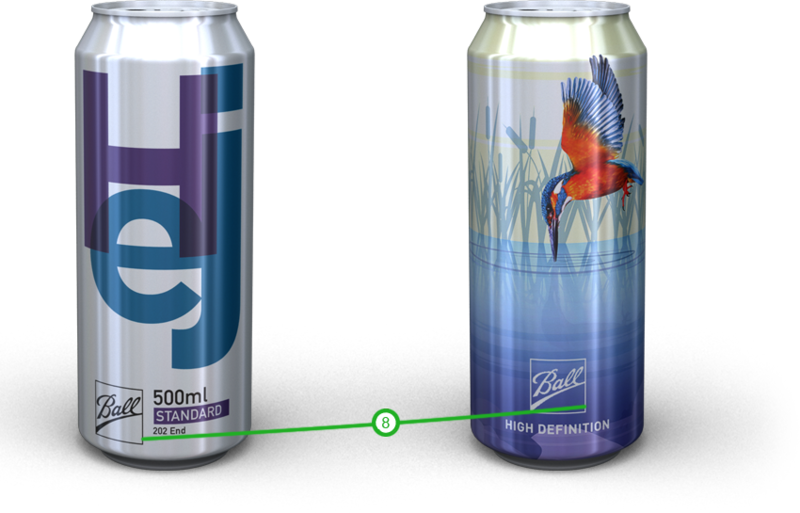 Learn how to optimise your design for the can print process. A conventional printing plate is made by exposing a negative film onto the polymer of a steel backed plate using UV light. After the exposure, the plate is washed to remove the excess polymer. A plate made using the Computer Ditigal Imaging technique receives the image directly from a computer file which is printed by a laser directly to the film attached to the plate. After short exposure under UV light, the excess polymer is washed off. 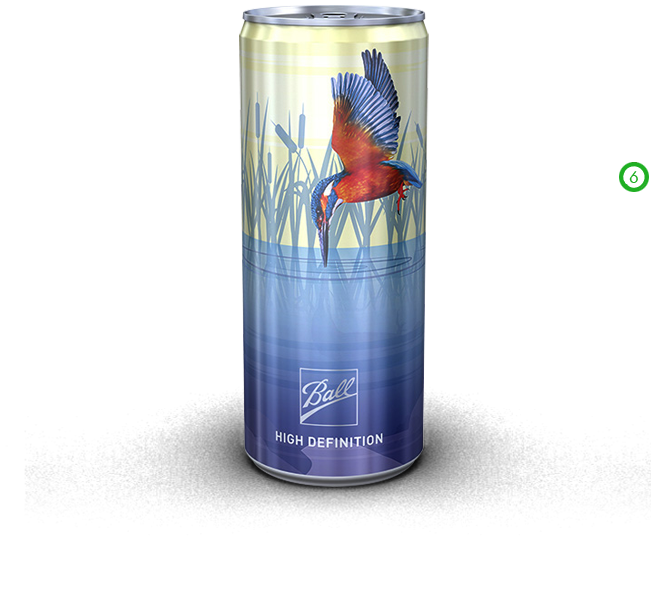 The detail is engraved directly on the printing plate by a high precision laser. 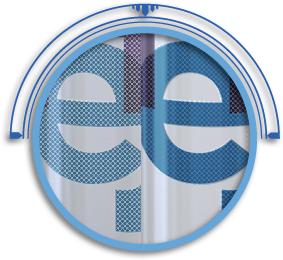 Are you looking to achieve the effect of a total fade out of your screen? Are you looking for ideas to hide the "hard line" which a fading vignette leaves on a can? Is your priority to achieve a consistent image on your design? Are you looking for a subtle pattern in the background of your design? 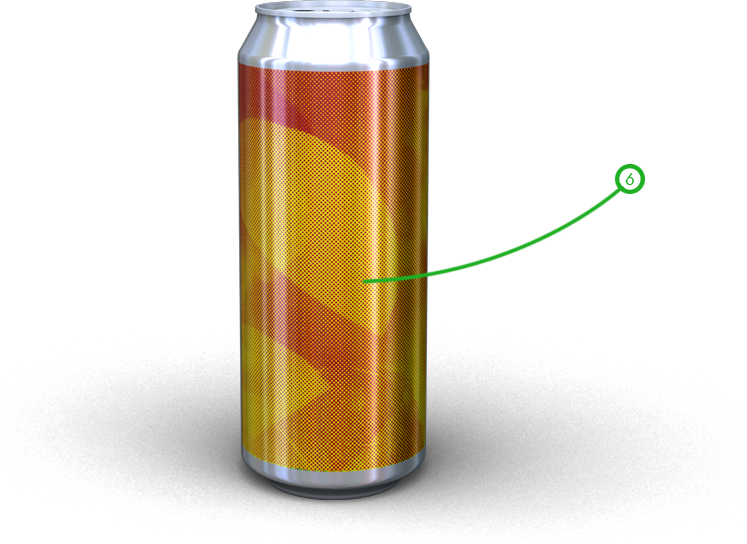 Would you like to create the perfect overlap on an aluminium background? Do you like to create an illusion of fading colours towards the middle of your design? Consider the use of a course screen instead of a very fine screen. This often gives the illusion of fading to zero. to hide the hard edge of the vignette. Consider to use only one strong facing illustration on your design. 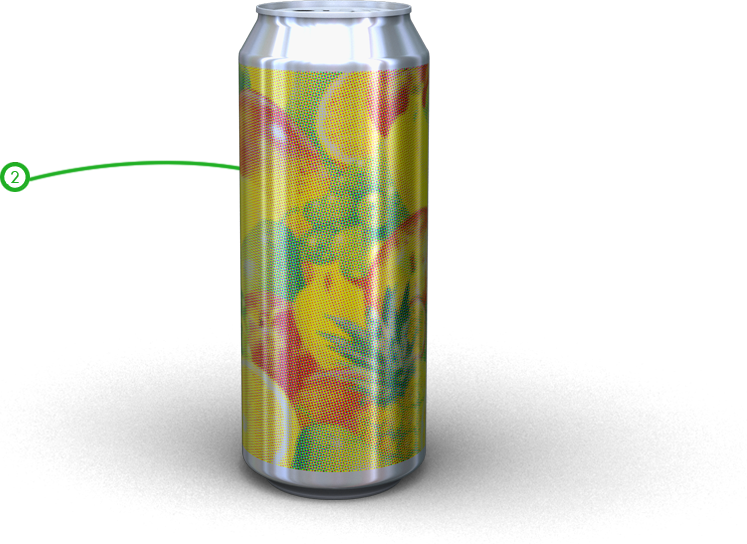 Use the back of pack for your ingredients list or a different image. 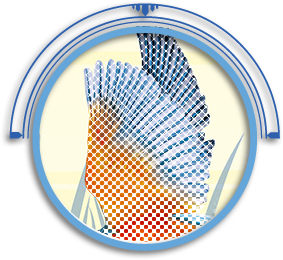 variation (inherent to our process) on the images on your design. 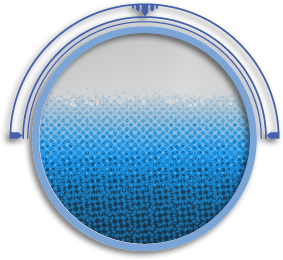 consider to print the background with a double pass and the pattern with just a single pass of the background colour. This will guarantee a consistent subtle pattern in the background. in the position where the design overlaps, this way you don't notice the overlap at all. Instead of using dots for your vignette, consider the use of cone shaped lines. 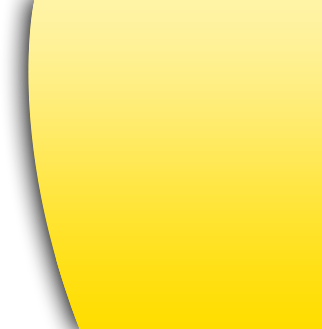 without leaving the hard edge in the middle which appears with a normal vignette. 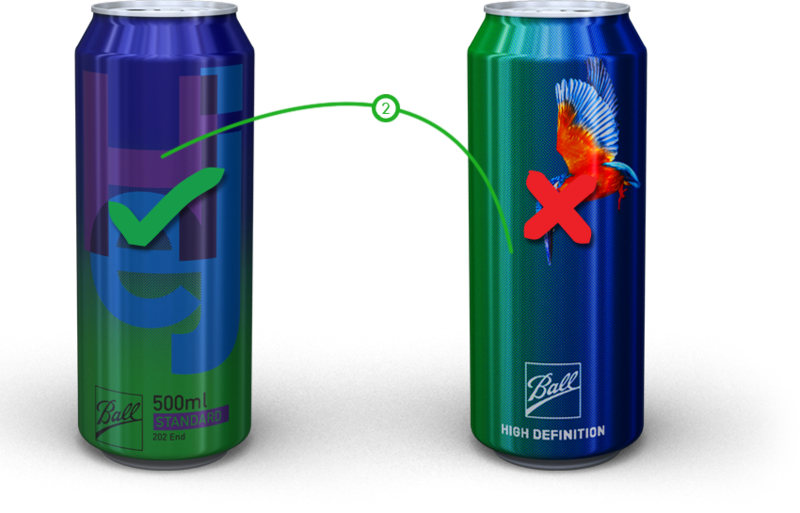 HD printing uses special colours – not CMYK. 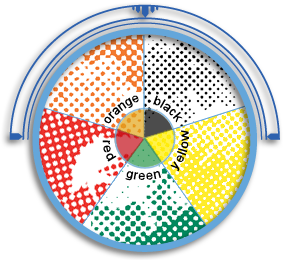 A CMYK image will be separated into special colours during reproduction. Because the screen ruling for HD printing is higher a representation of an image will be closer to the original, but still will not match it exactly. 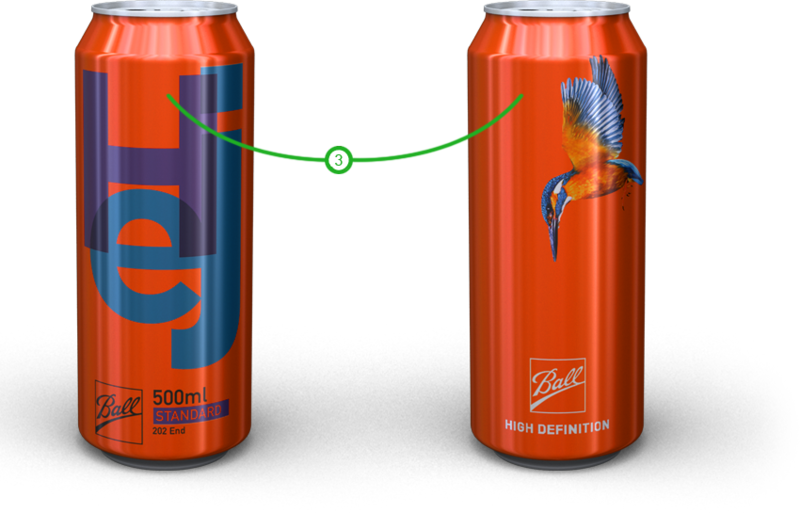 Avoid using colours which are needed in an image (a), elsewhere on the can (b). This will allow Ball to best control these colours used in the image in production. 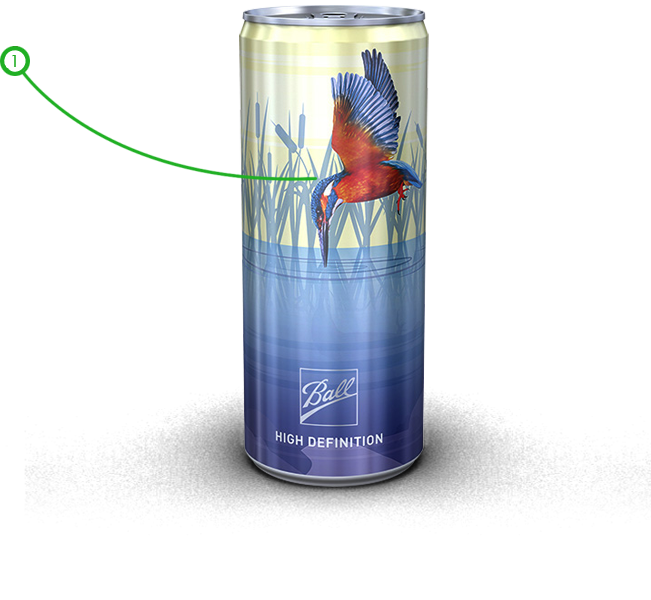 The maximum screen ruling for HD printing in can design is 120 LPI. 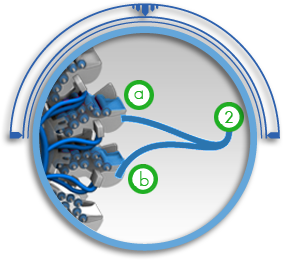 Ball will decide during the reproduction process based on all elements in the design, which screen ruling gives the best final result in production. The minimum dot is 2%. 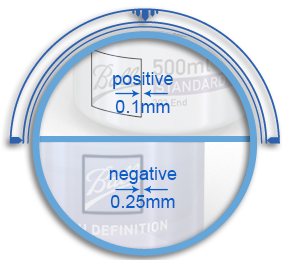 In High Definition print the expected dot gain in production is between 10 – 15%. 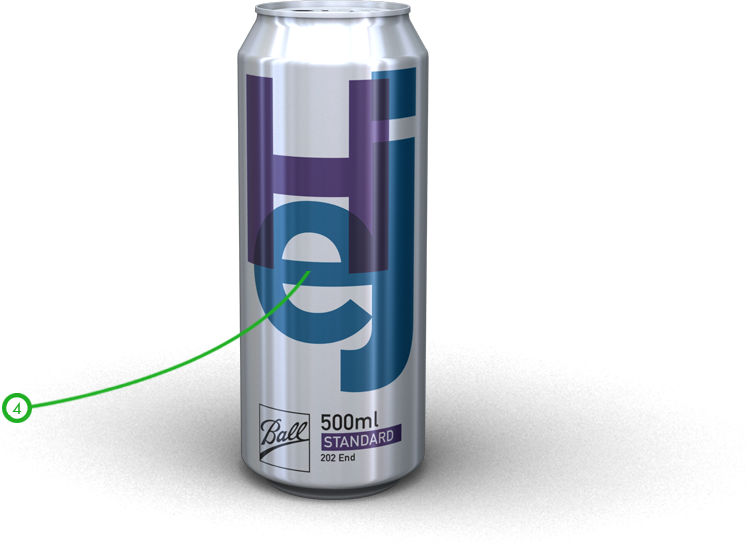 Fading to 0 under circumstances is possible, although leaving an even soft edge over a big area of the can does not belong to the possibilities (dots will not consistently hold on the plate). It is possible to create an optical illusion of a third colour by partly overlapping screens. 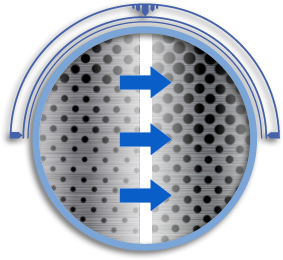 This will only be applied to screens and in order to get the best possible end result, it will have to be done by a Ball qualified specialised reproduction studio. 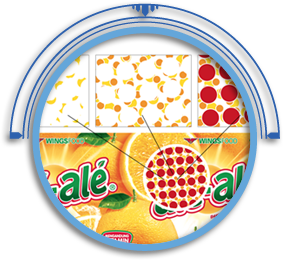 Can printing uses spot colours – not CMYK. 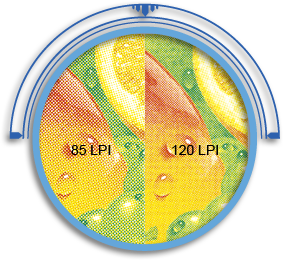 An image using CMYK colours is separated into spot colours during reproduction. The aim is to give a close representation of the original, but it will never match it exactly. 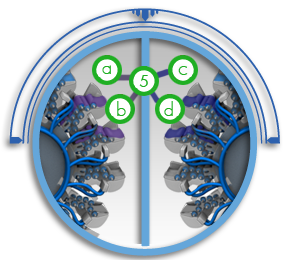 Ball will decide during the reproduction process and based on availability which screen ruling is going to be used. 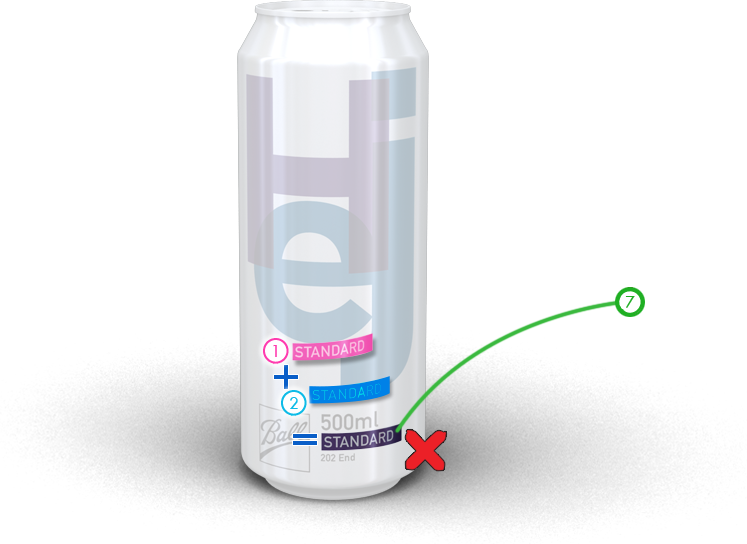 A screen should continue over the entire surface of the can, fading a colour to zero and leaving a soft edge is not possible due to the dot gain experienced in the can printing process. Avoid printing colours wet-on-wet as much as possible. 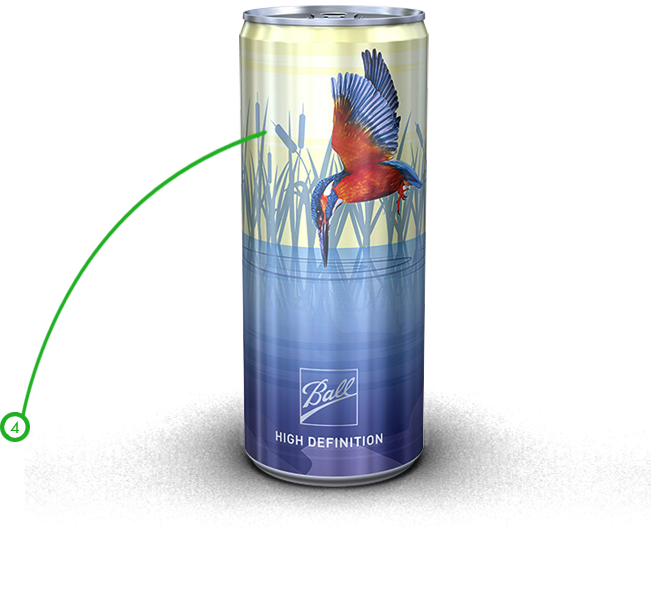 Due to the nature of the printing process we have limited control over the final result. Colour variation in batches can be expected. 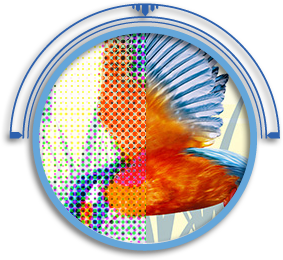 Wet-on-wet printing can only be considered with complimentary colours, screen size & angels. 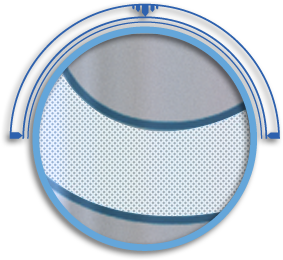 Contact Ball in a very early stage of the development process, so we can help you achieve the best result. It is not possible to create a third colour using two colours printed on top of eachother. 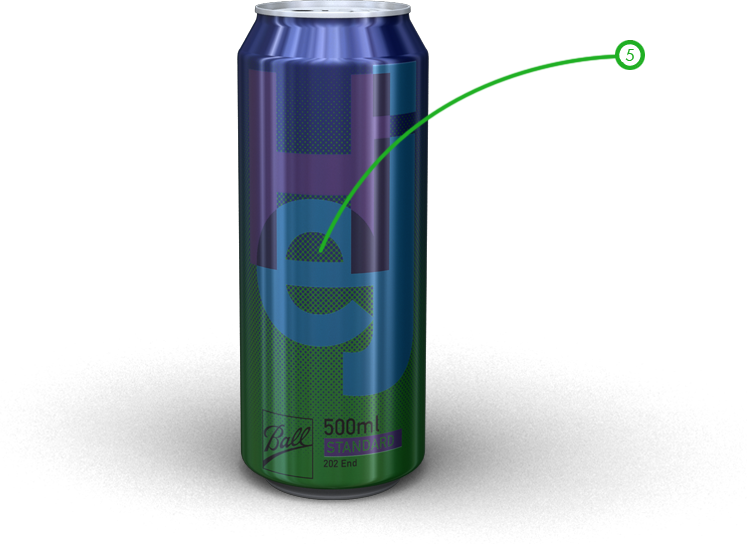 The consistency of this colour cannot be guaranteeed throughout the production. 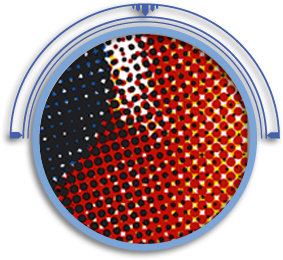 It results in contamination of the colours in other areas of the design. 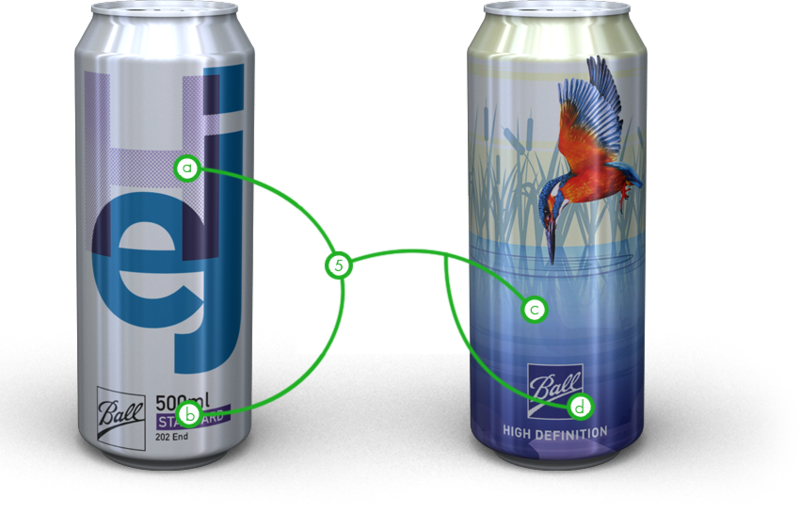 The process used to print cans is called “Dry-offset letterpress”. This means that a printing plate is used for each colour to print that part of the image to a blanket. One common blanket collects all the different colours, until the full mirror image of the design is complete (1 rotation of the blanket). 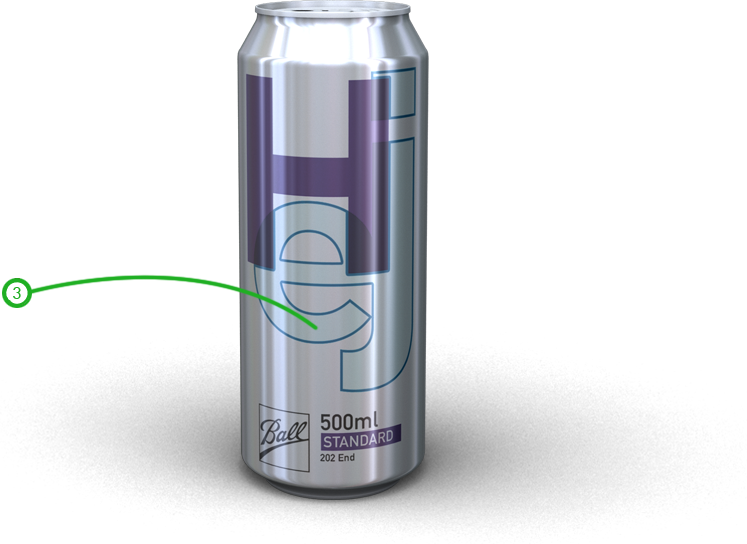 The blanket transfers all the colours at once to the can – see also print processes for more details. 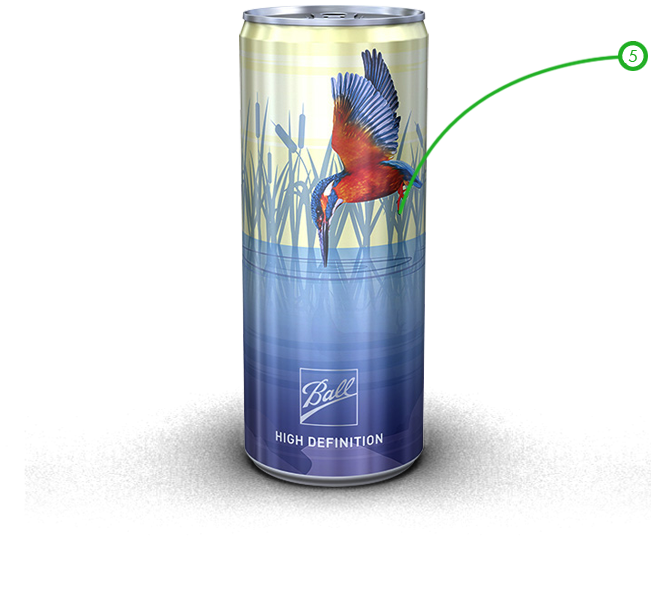 Maximum resolution used in can printing is 120 LPI. 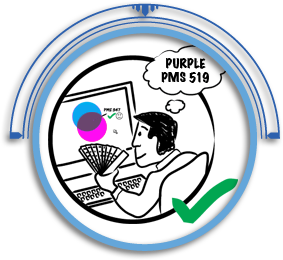 During the reproduction process the customer supplied artwork is separated into spot colours and the relevant screen ruling applied. We also introduce “air gaps” to protect the design against colour contamination during printing. This process can only be carried out by a Ball qualified reproduction studio. Vignettes should always run from top to bottom (vertical) with a maximum of two colours opposing. 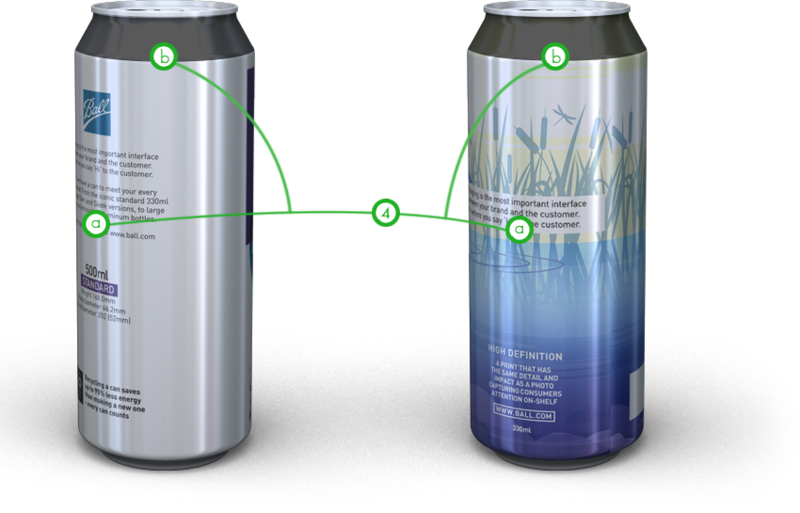 Horizontal vignettes running around the can should be avoided. 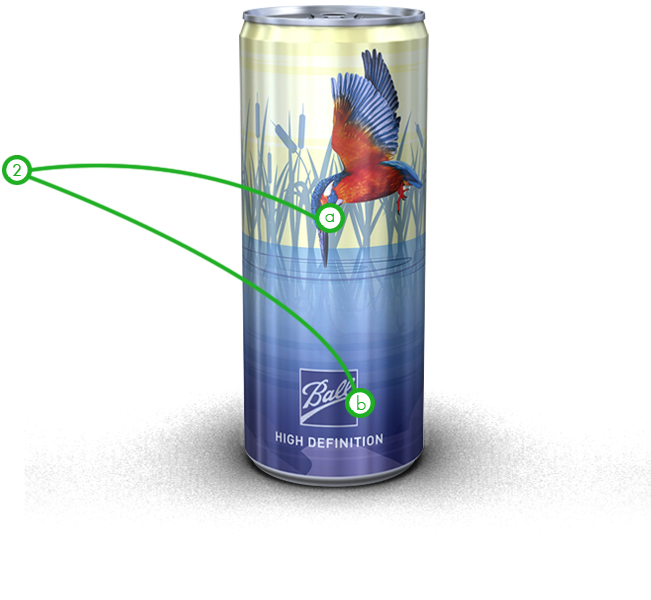 Due to the nature of the process small differences in pressure at print stage and the lack of controls of ink in the print direction make it impossible to control the printed end result. 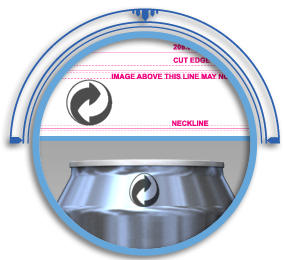 The neck of the can is formed after printing and therefore any image in this area will be distorted. 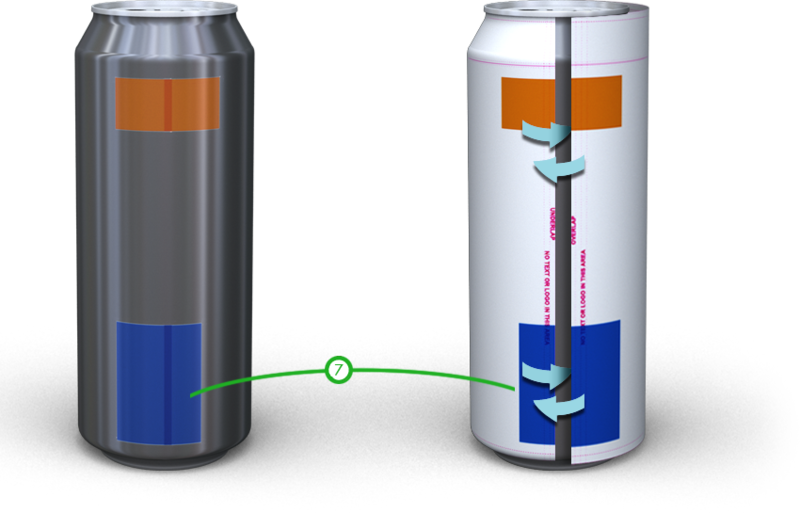 Because a can is cylindrical, your design will overlap on itself by approximately 2 mm. 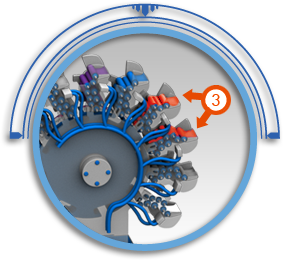 Point-to-point contact in the overlap differs by production line & size. 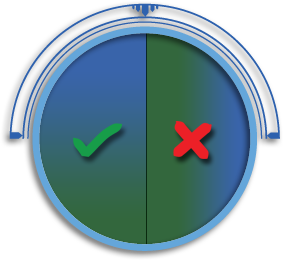 Perfect alignment can therefore not be guaranteed in the overlap. 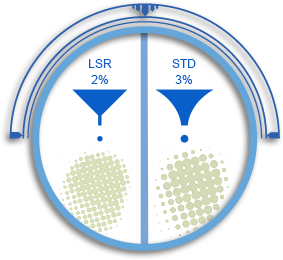 We recommend to keep the overlap free of any continous graphics and text. 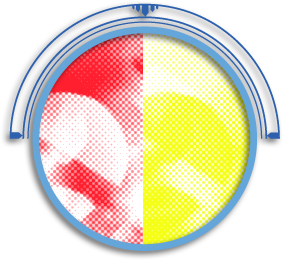 An ideal overlap has the same solid colour on either side of the design. 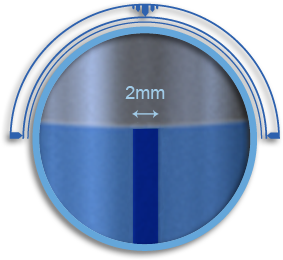 To protect the colours on your design from contaminating, Rexam adds small gaps between all design elements in different colours during the reproduction process. The size of the gap depends on the colour and the size of the elements in this colour. 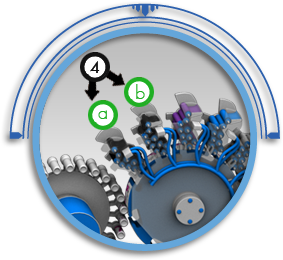 Air gaps disappear as they typically fill up with ink as this spreads during production. 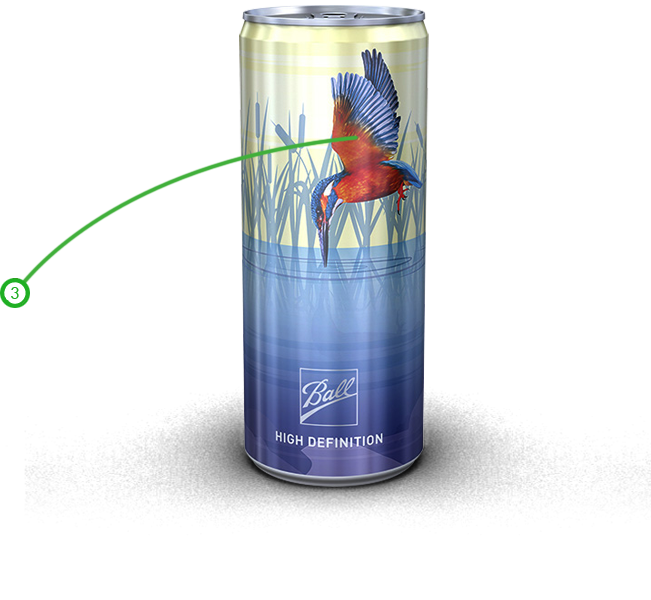 They are calculated to suit each of our plants to protect the colours on your design from mixing. As these gaps are specific to our process they can only be added by a Rexam qualified reproduction studio. 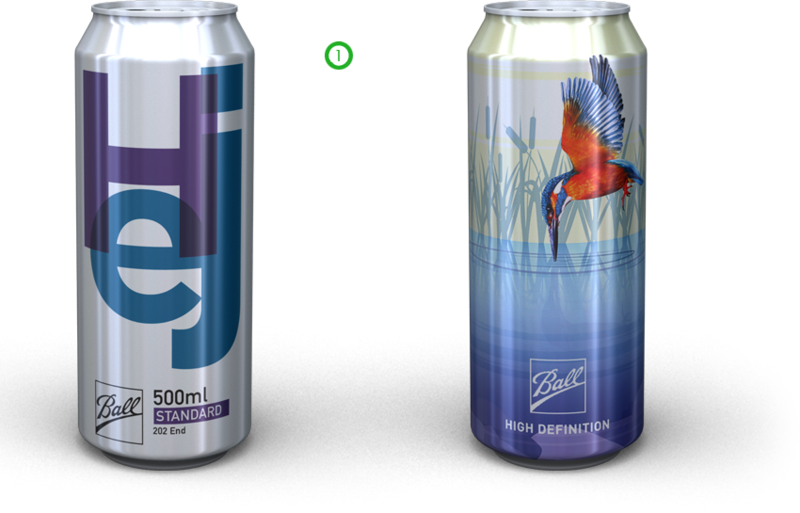 At the start of the creative process for a new design consider which type of packaging you will use for your product. 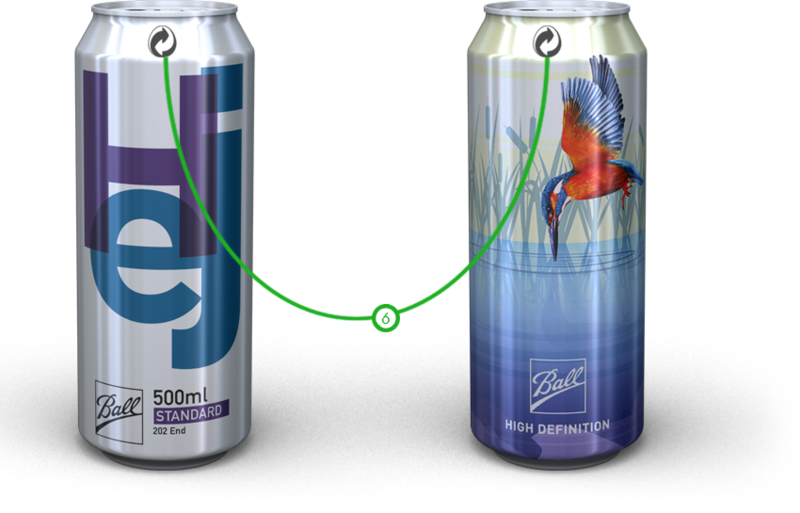 If cans are amongst them, we recommend to develop the design for the can first. 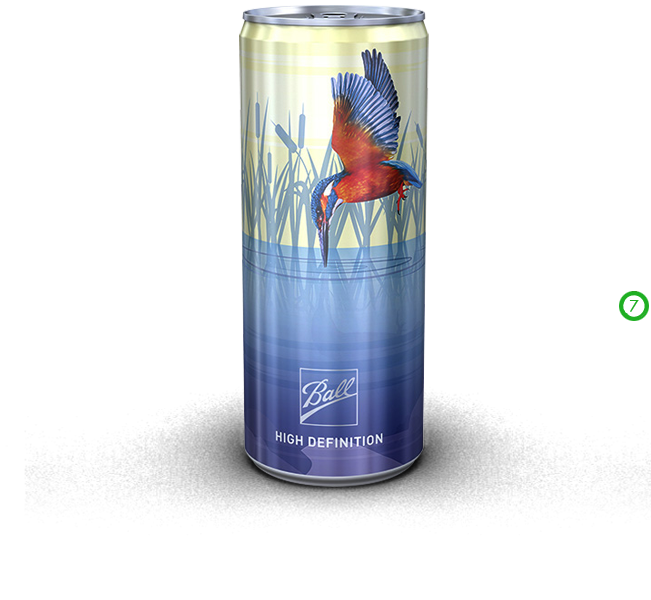 If your design is suitable for can printing it is suitable for other packaging as well. The other way around has proven difficult in the past. The information in this section helps you understand the boundaries of the dry offset letterpress process and shows you how to use them to your benefit to make the best out of your design.